Redsn0w for iOS 4.3.1 untethered jailbreak has just been updated to version 0.9.6rc11. Just like Sn0wbreeze 2.5.1 for Windows, the new Redsn0w 0.9.6rc11 adds a new option to enable custom animated boot logos for iPhone, iPad and iPod touch. 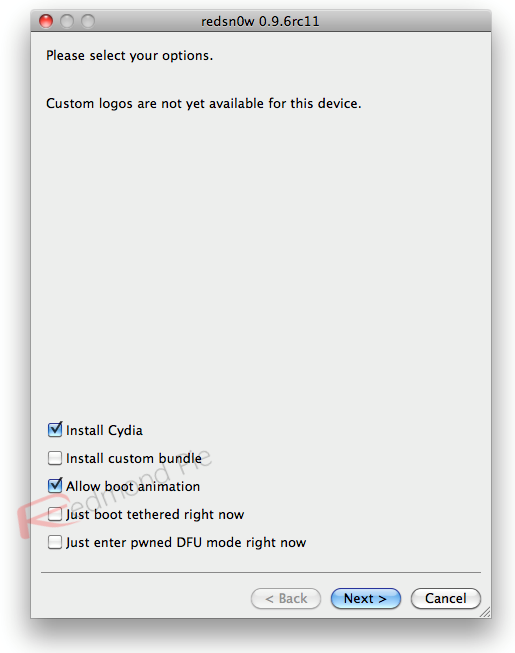 Along the way, we’ve also added the option to enable boot animations…these animations can be installed via Cydia, but be sure to select which animation to use via the Settings->Bootlogo setting after you’ve downloaded an animation (and again, you can just run rc10 over your existing jailbreak…be sure to de-select Cydia to avoid package conflicts). Instructions for jailbreaking iOS 4.3.1 untethered using this new version of Redsn0w are exactly similar to the last release. Simply download Redsn0w 0.9.6rc11 for Windows or Mac from the links given below, and then follow our detailed step by step guide posted here to jailbreak iPhone 4, 3GS, iPod touch 4G / 3G, and iPad running the latest iOS 4.3.1 firmware. Those of you who are already jailbroken on iOS 4.3.1 using Redsn0w 0.9.6rc9 can simply rerun Redsn0w 0.9.6rc11 over the existing jailbreak by selecting “Allow boot animation” option as shown in the screenshot above, but make sure you uncheck “Install Cydia” option to avoid package conflict with the existing jailbreak. Once done, simply follow the Step 2 onwards in the guide posted here to install “Apple Boot Logo” (aka Animate), and you’re well on your way to some animated goodness. NOTE: Those of you who rely on a carrier unlock MUST STAY AWAY from Redsn0w and stock iOS 4.3.1 firmware.